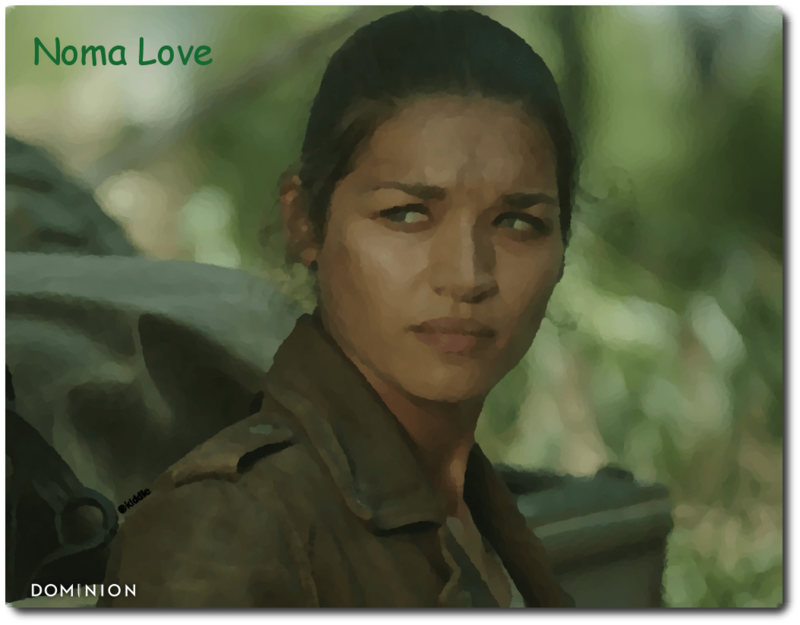 ‘Dominion’ TV Show – Do we love Noma, or do we hate her? Or, both? How Do Dominion Fans Feel About Noma? A Dominion TV show reviewcap (a combination between a plot recap and a reviewer’s opinion as they watch it) of Sine Deo Nihil, Episode 213 of SyFy’s original program, DOMINION, left me with a slightly different take on at least one of the characters. In this case, it was higher angel Noma (Kim Englebrecht). I’ve LOVED watching this show for SO many different reasons – the plot, characters, actors, music, settings all made Season 2 (S2) great. But, one of the best things about the show was the fan interaction and dialog. The fans all had pet theories. Some of these were carried all the way from the Pilot episode of the FIRST season. My early theory was that Noma was not just arm and shower decoration for Alex (Chris Egan). Series writer and creator, Vaun Wilmott hinted on Twitter last year that Noma was a crucial character in S2. So, initially it was surprising when it seemed as if Noma was only a buddy cop ride along partner, doing little but accompanying Alex, providing some interesting dialog and some pretty good fights. Fans couldn’t help but wonder: “When will Noma’s importance be revealed?” Her significance begins to surface a little bit in Episode 204 when “the good guys” get the Amphora of Darkness from Julian (Simon Merrells). (By the way, uh, we need Season 3 to figure out how Julian got his hands on ANY of the amphorae). Still, it’s more babysitting the amphora (and fighting) and being a partner than anything else at that point. That is, until Julian captures them and decides that the way to force Noma to hand over the amphora was to threaten to torture or kill Alex. Apparently, Julian had a better grip on their relationship than the two of them. This buddy cop partnering comes to a fairly dramatic climax in Episode 206 when Noma literally sacrifices her wings for Alex. Likely, there is no higher price an angel could pay. So, why would she do this? Either she was still trying to honor her debt for killing Charlie (Reine Swart), OR she loved Alex. I think it was the latter. I felt the entire season that Noma looked uneasy at best, as if things had spiraled out of control and she was no longer sure of how she was going to keep him safe, or even understood what he was. Julian (not pictured, Simon Merrells) has pinned Noma (Kim Englebrecht) against the wall. The loss of her wings marked the disintegration of Noma’s being. She says to Michael (Tom Wisdom) that she no longer knew what she was, she wasn’t fully an angel, but not a human either. She’d never be fully accepted as one (especially once people found out about her past). Losing her wings cost Noma her sanity, although it was pretty difficult to tell this definitively until we got to Episode 211. There, we saw her naked longing for her wings (the single most important thing to her) and her willingness to die if she couldn’t get them back. We also saw Michael’s first full indication that Noma might not be as trustworthy as we all thought she was (at least based on her being willing to pull her wings out for Alex). Noma (Kim Englebrecht) sees herself with wings on the roof in Vega. This all comes to a head in the season finale, where she unfurled those beautiful, fluffy, gorgeous, white wings and reveals a look that is absolutely terrifying. It’s clear that Noma has made a terrible exchange for those lovely wings. And, thus begins the angst of the viewers. Do we hate her for this potentially deepest of betrayals? Or, are we like cast off lovers who pine for the loss of what we can never recover? This show has excelled at revealing the complexities of characters. There are those you love to hate (and secretly love) (Julian!) and those you hate, and love, and sympathize with and hate, and then love again (Gabriel!). Is there redemption in Noma’s future? What exactly did she exchange, and will she commit the ultimate treachery of handing Alex over to Lucifer? We actually don’t know yet. We frame our feelings for characters in different ways. Sometimes it is the person’s portrayal and other times, it is what the character stands for. I think all of us feel very, very hurt now by the depth of Noma’s betrayal, but from her character’s perspective, she has had MILLENNIA of angel experience. The draw of wings, which represent the path back to heaven and God, was irresistible. Plus, she did lose her sanity when she pulled her wings off (see Vaun Wilmott’s comment in the October 1, 2015, TVInsider article). This was very much in line with the show’s penchant for reversing the nature of characters good/bad to bad/good and back again showing that NONE of them are truly good or evil. I just can’t bring myself to hate her (yet). I hope SyFY allows us at least a third season to further explore what Noma TRULY exchanged for those wings and why she, of all the angels, felt God’s presence all around Alex.